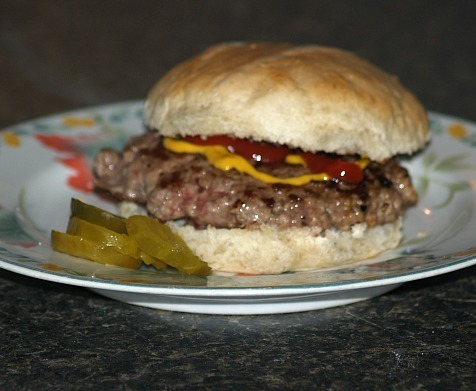 For years I wanted to learn how to make buns; that is the ones for sandwiches like for hamburgers. All sandwiches taste better when they are on good bread or buns. I am usually disappointed with the outcome when using commercially made buns. In learning how to make buns (Sometimes referred to as rolls) I found they have a long history in Europe and other areas of the world. Sometimes these buns are round but often they are oblong shaped and might even resemble small loaves of bread. German buns are known by different names depending on which area you are in. The most notable way of using this type of bread in Germany is to slice in half and sandwich a bratwurst between the slices topped with sauerkraut. France has long been known for their baguettes. This type of long shaped bun or loaf is made in many different lengths. This country is also popular for brioche which is made in large small sizes. The small ones are like buns which are sometimes stuffed like sandwiches. Due to the popularity of the French baguettes, Italy was pressured to come up with their own version of a bun or roll. The ciabatta, small loaf, was developed to supply the need to fill the demand for sandwiches; here we recognize the name as Panini sandwiches. Learning how to make buns in many parts of the world is not to make them for sandwiches. 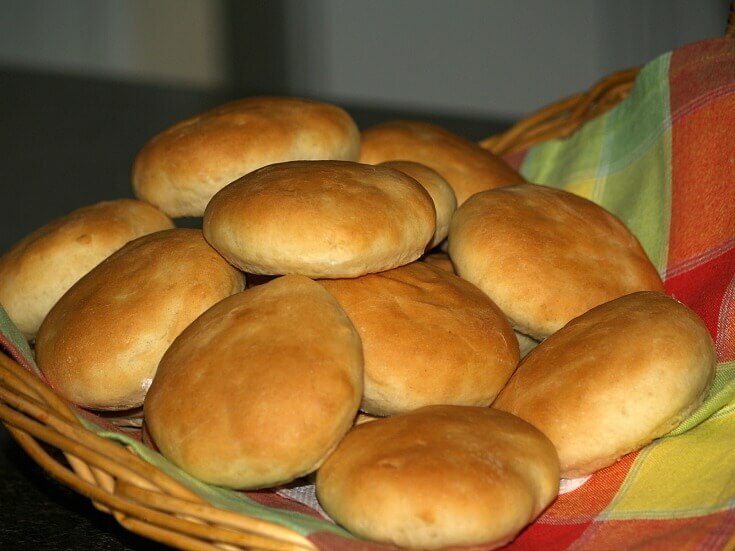 Throughout South America buns are made with a lot of corn flour, various cheeses, cassava and eggs. Because sandwiches have not really taken hold in most of these countries yet, the buns are made smaller and served with meals; especially popular for breakfast. Sometimes I get hungry for a good hamburger. Since I always have great ground beef from butchering a beef, this means having a good tasting and textured homemade sandwich bun. I love learning how to make buns many different ways. Below are some of my favorite recipes. I learned how to make buns with whole wheat for my hamburgers. This is one of my favorite recipes. They are soft and delicious! Soften yeast in ¼ cup warm water in a large bowl. Using mixer beat in 1 cup warm water, milk, butter, honey, molasses and salt. Set aside 1/3 cup wheat flour; beat in remaining wheat flour 1 cup at a time. Beat in remaining flour until dough is too stiff for beaters; remove beaters. Sprinkle reserved whole wheat flour on surface and turn dough out on it. Knead dough for several minutes using the excess flour; (If needed add a little more all purpose flour. Place dough in a greased bowl, cover and let rise until doubled in a warm draft free place about 1 hour. Punch dough down and divide into 16 balls; press balls flat and place on greased baking sheets. Cover trays and let rise until doubled about 1 hour in a warm draft free area. Beat egg white lightly with cold water and brush tops of buns. 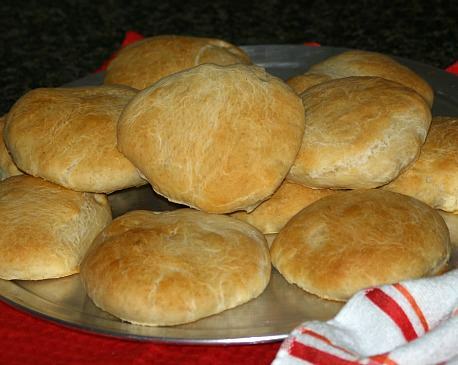 This is another favorite recipe of mine when you are learning how to make buns. The texture is different from the first recipe but equally as good. It just depends which one I am hungry for. Place warm water in a large bowl; sprinkle yeast and 1 teaspoon sugar over water. Let yeast mixture stand 5 to 10 minutes until foamy. Add 2 cups of flour and remaining 1 teaspoon sugar; stir until well blended. Stir in ½ cup flour; stir in enough of remaining flour to make soft dough. Turn dough out onto lightly floured surface; knead in enough flour to make a smooth dough. Knead until smooth and elastic about 8 to 10 minutes. Place dough in a greased bowl turning to coat surface of dough. Cover and let rise in a warm draft free place until doubled in bulk about 1 hour. Grease a baking sheet and sprinkle with cornmeal. Punch dough down and divide into 7 equal pieces; shape into balls. Flatten balls and place the first in the center of pan. Place remaining 6 flatten balls around the first in a circle leaving space for expansion. Mix egg with cold water and brush tops of buns. Bake 10 to 15 minutes until golden brown. OPTIONS: After brushing with egg water mixture you can top buns with sesame seeds, poppy seeds, grated cheese, coarse salt or numerous other toppings. Learn how to make buns with another good recipe. This recipe has more yeast for the cups of flour, has powdered milk and butter. Great buns for hamburgers! Combine dry milk, sugar, yeast, butter and 2 cups of flour in large mixing bowl. Stir hot water slowly into the mixture blending well with mixer. Beat 2 minutes on medium speed of mixer scraping bowl from time to time. Add salt and blend in enough flour to make a stiff dough. Turn dough out onto a lightly floured surface and knead 8 to 10 minutes or until smooth and elastic. Place dough in a large greased bowl turning to coat all areas. Cover and let rise in a warm draft free place about 60 minutes. Punch dough down; cover and let rise another 20 minutes. Cut dough into 2 equal parts; cut each part into 8 equal pieces. Shape each piece into a ball; flatten into a bun shape and place 2 inches apart on greased baking sheet. Let buns rise again until doubled in a warm draft free place about 1 hour. Bake buns 15 to 20 minutes; cool on wire rack. Learn how to make buns with a fast and easy recipe. Mix water, oil, sugar and yeast; let set 15 minutes. Add salt and eggs; mix in flour. Shape mixture immediately into buns and place on greased baking trays. Let rise ten minutes; bake 10 minutes until golden brown. 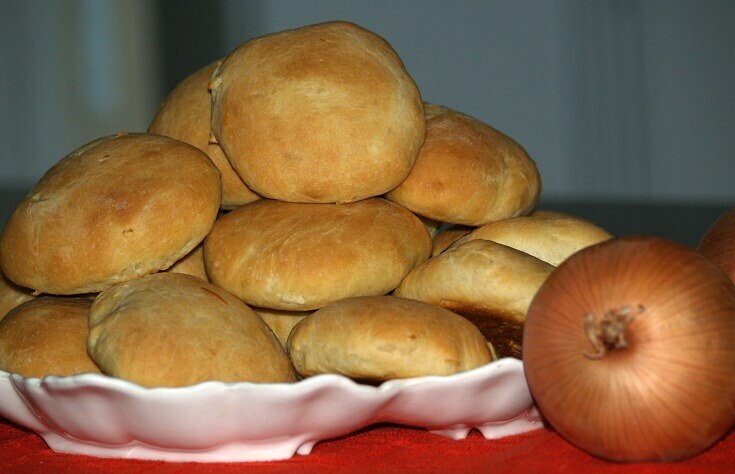 Learn how to make buns with mustard and dried onion. Scald milk and set off heat; stir into milk the onion, mustard, oil and sugar. Cool milk mixture to about 112F to 115F degrees. Pour warm water in cup; stir in yeast and let stand 5 minutes. In large mixing bowl combine the cooled milk mixture and yeast mixture. With mixer beat in about 4 cups of the flour; beat in enough flour to make soft dough. Turn dough out onto floured surface and knead until smooth and elastic. NOTE: Add more flour if needed until no longer sticky. 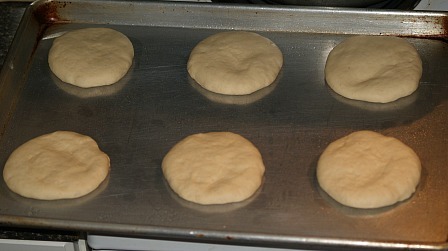 Place dough in a greased bowl turning to coat all sides. Cover bowl with plastic wrap and then cover with clean cloth. 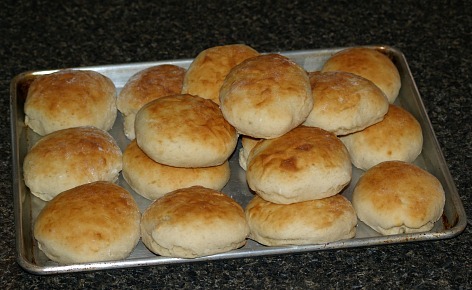 Let rise until doubled in bulk about 1 to 1 ½ hours; punch down and shape buns. NOTE: I use 1/3 cup to measure dough for shaping buns. This makes the buns about 3 inches when baked which I prefer. If you like a larger bun use about ½ cup of dough. This recipe makes 21 buns using 1/3 cup dough. Shape dough in ball and press out with hands to flatten. Place flatten dough on lightly greased (Or parchment lined) baking sheets about 1 inch apart. 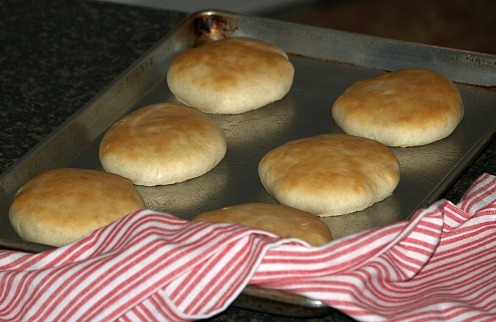 Let buns rise until doubled about 45 to 50 minutes; bake until golden about 20 to 25 minutes. Scald milk and remove from heat; stir in butter, sugar and salt. Cool mixture to warm (About 115F degrees). Add yeast to warm water; stir and set aside 5 minutes. In large mixing bowl beat eggs until frothy; beat in cooled milk mixture. Beat in warm yeast mixture and 2 cups of flour. Beat in more flour until soft dough forms. Knead until smooth and elastic adding more flour as needed. Transfer dough to a greased bowl turning to coat all sides. Cover with plastic wrap and then a clean cloth. Let rise in warm place until double in bulk about 1 ½ hours. Punch dough down and let rest 15 minutes; divide dough into 18 pieces. NOTE: I measure the dough with 1/3 measuring cup. Shape dough into balls and press into buns; place on parchment lined baking sheets. Cover with clean towel and let rise about 1 hour until doubled. Bake about 20 minutes until golden brown; makes 18 3 inch buns. This is a great recipe to learn how to make buns. Melt butter in a small saucepan; sauté onion until tender but not brown. Add yogurt and water; blend well and heat until very warm (About 120F degrees). Meanwhile blend ¾ cup flour, wheat germ, sugar, salt and dry yeast in a large mixing bowl. Add warm liquids and blend quickly with spatula into dry ingredients. Mix on low speed with mixer to blend gradually increasing the mixer speed. Beat mixture about 2 minutes on medium speed scraping the sides of the bowls frequently. Add egg, ½ cup additional flour and shredded cheese; beat on high speed about 2 minutes. Stir in enough additionally flour (About 2 cups) by hand to make a soft dough. Turn dough out on a lightly floured board and knead 8 to 10 minutes until smooth and elastic. Place dough in a clean greased bowl turning dough to grease top; cover and let rise until doubled. Punch down dough and divide into 12 equal parts and smooth into ball shapes. 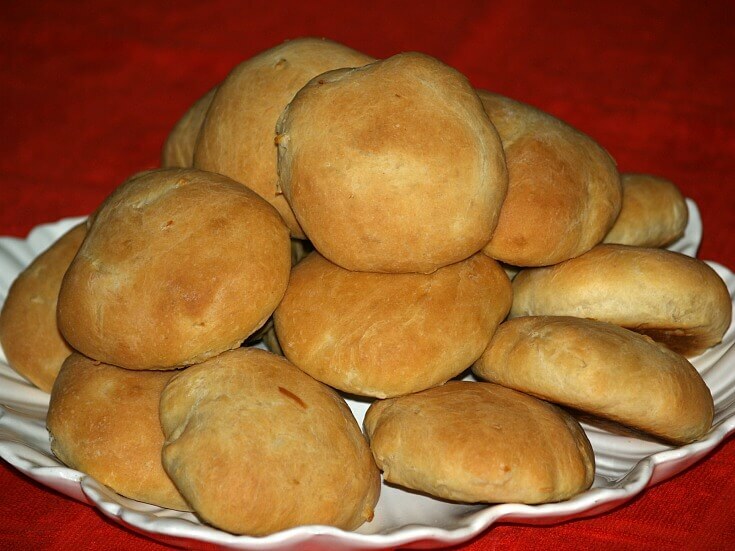 Place balls on a greased 15X10 inch baking pan; flatten each ball to make bun shapes. Cover loosely with plastic wrap and let rise 1 hour or more. Bake buns 12 to 15 minutes; remove from pan. Learn how to make buns that are buttery. These are great for lentil burgers. Lightly spoon flour into measuring cup and level off. Measure 1 ½ cups of the flour into another large bowl; add sugar, salt and yeast and stir in. In a small saucepan combine milk, water and butter; heat to about 120F degrees. Add warm milk mixture and egg to flour yeast mixture; beat on medium speed of mixer for 3 minutes. By hand stir in 1 ½ to 2 cups of measured flour to form a stiff dough. On floured surface knead in enough of remaining flour until smooth and elastic. Place dough in a greased bowl, cover and refrigerate overnight. Remove dough from refrigerator; punch dough down on lightly floured surface and divide into 12 parts. Cover dough with inverted bowl for 15 minutes; shape dough parts into smooth balls. FLATTEN each ball into 4 inch circles; place 2 inches apart on greased cookie sheets. Cover trays and let rise until double in size; about 45 to 60 minutes. 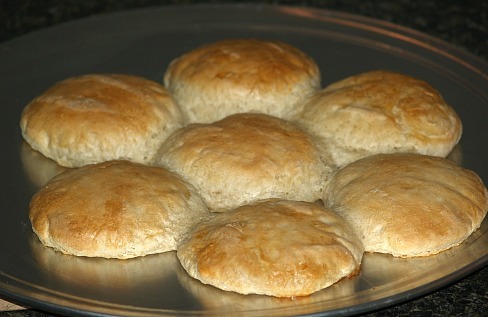 Brush rolls with melted butter; bake 15 to 20 minutes until golden brown. Remove rolls from hot trays immediately. Learn how to make buns using rye flour. Measure 2 cups of the measured flour into another large bowl; add sugar, salt and yeast. In a small saucepan heat water, molasses and oil to 120F degrees; add warm liquid to the flour yeast mixture. Blend mixture on low speed until moistened; beat 3 minutes on medium speed. By hand stir in RYE flour to form a stiff dough; on flour surface knead in ¾ to 1 ¾ until dough is elastic 8-10 minutes. Place dough in greased bowl; cover with plastic wrap and towel. Let rise about 1 hour in warm place until double in bulk. Punch dough down and divide in 12 parts; allow to rest on counter covered with inverted bowl for 15 minutes. Shape each part into a smooth ball and flatten into 4 inch circle; place 2 inches apart on prepared cookie sheets. Let rise about 1 hour until double in size; PREHEAT OVEN TO 375F degrees. 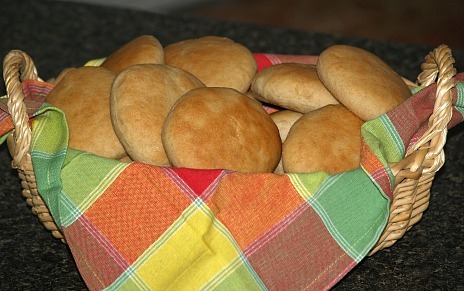 Brush buns with melted butter; bake about 15 minutes or until buns are golden brown.